This season expresses the term in more specific details. The first word expressed in this season is ‘Chichu’, which is made up from two words, ‘chissuru’ and ‘chu’. ‘Chissuru’, as mentioned in this Solar Term is opening or coming out from the holes and dens of hibernation. ‘Chu’ is Chinese-derived reading of a kanjiW meaning ‘mushi’, the insects. Therefore, the phrase is focused on insects which is about to come out of their hibernating holes during cold winter weather. There are some insects which hibernate, both imago wintering and larva wintering, in Japan. Insects which imago-winter hibernate on the surface of tree trunks in a group which could be found if you are careful as they mimicry. There are some insects which hibernate in holes beneath the soil or in the tree trunks which when they come out, gives us the exact image to the season’s phrase today. 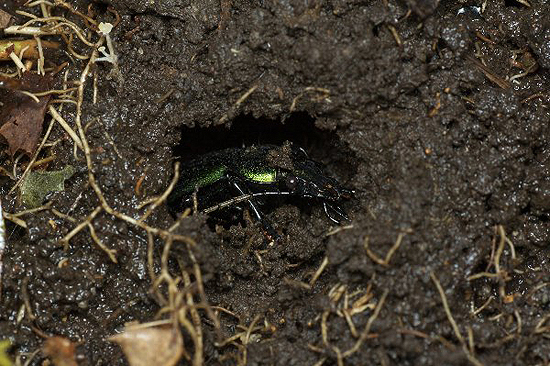 Blue ground beetle, ‘Ao-osamushi’, in its hibernating hole. Photo from ‘Kiriri kiriri kiriri‘. Ground beetleW is one of the insects which hibernate in Japan. They hibernate within the tree trunks or beneath the ground by digging a hole. Above is one of the ground beetle seen in Japan, the blue ground beetle, which has come out from its hole for hibernation, still not hibernated because the hole was too shallow. As you can see, the holes made for them to hibernate does not have lid or doors to cover their entrance though the dug soils or rotten woods should cover the entrance, acting like the lid or the door to their den. A hibernating insect, Japanese diving beetle, with daffodil. 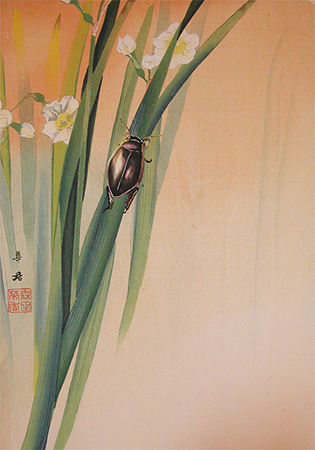 Painting by Kako Morita. Going back to the phrase, ‘ko-wo hiraku’ is a sentence meaning ‘to open the door’. ‘Ko’ is a Chinese-derived reading of a kanji meaning ‘to’, meaning the door. ‘Hiraku’, again here, is a verb using kanji which has a positive meaning of ‘to open’. Therefore, the whole meaning of the phrase is; ‘the hibernating insects open their doors’. It is interesting that our ancestors have used ‘the door’ in front of the insects which were about to get out of their sleeping holes which actually do not exist. Because it was not the actual action of insects, just getting out of their holes that our ancestors wanted to express, but stepping into positive atmosphere which insects also feels as they are taking a part of the living universe which reminds us that spring arrival is a joy not only to human but also to those which have lives. Japanese Spanish mackerel, Sawara. Seasonal fish for its’ name in poerty and for tongues. Kanji of ‘Sawara’ made from ‘fish’ kanji on left and ‘spring’ kanji on right. 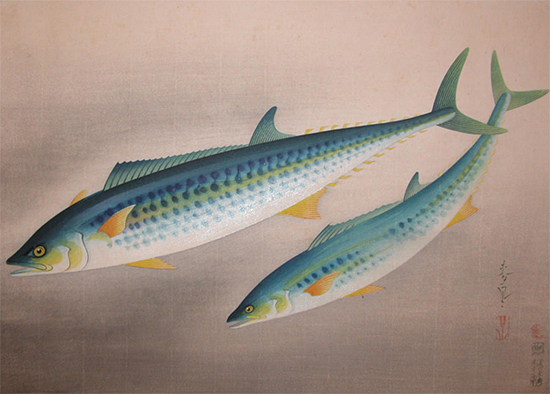 Sawara is a common fish in Japan which is well known as a fish of spring by its name in kanji character. Sawara in kanji, as you see on the left, is made up with two different kanji characters, ‘fish’ and ‘spring’. It is said that the kanji of Sawara was set as many Sawaras have been caught at Seto Inland SeaW at their spawning season which the season overlaps with the spring arrival, from March to May. Sawara is caught mainly in the west of Japan, the highest haul at Fukuoka prefectureW but famous as regional cuisine of Okayama prefectureW. The oldest record written of Sawara as regional cuisine of Okayama prefecture is of a Product Note written in Bizen ProvinceW and Bitchu ProvinceW at 17th century. Fresh Sawara of Okayama prefecture. Photo from ‘Okayama Prefectural International Tourism Theme District Inbound Promotion Meeting Official Site‘. Sawara is a fish quick to spoil which means that the fish was not suitable for eating raw as sashimiW unless near the landing harbour. Okayama was the very place and it still is the place where you could eat Sawara as sashimi. 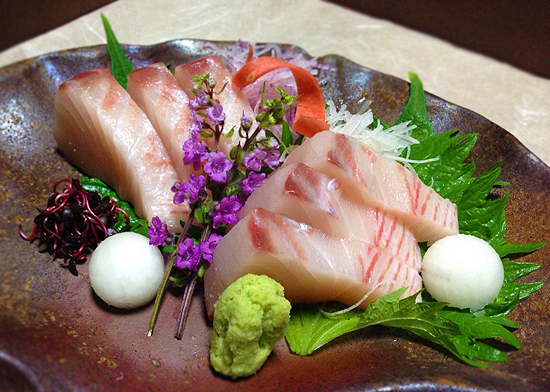 Apart from Okayama, Sawara in raw style is rarely served. Sawara made into sashimi. Photo from ‘Fujihiro, Sakyraya Official Blog‘, a restaurant located in Nodaya-cho, Kita-ku, Okayama-shi, Okayama prefecture. 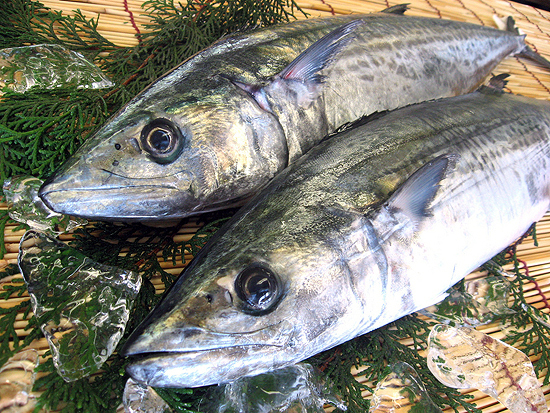 Still, Sawara was and is a common fish in Japanese cuisine at this time of the year. It is also known as one of the advance-fish, ‘Shusse-uo’ in Japanese, and thought to be an auspicious food fish. We call it an advance-fish because Sawara changes its name according to their growth. Sawara is called ‘Sagoshi (Sagochi)’ until the size less than 50cm in length, ‘Nagi’ at the length from 50 to 60cm then ‘Sawara’ when it becomes more than 60cm large. It could be grilled, preserved in misoW (grilled to eat) called ‘Saikyo-yaki’ or deep fried but unsuitable for boiling as the fresh is too soft for boiling, it will fall apart. 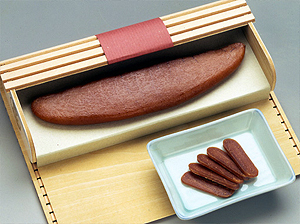 ‘Karasumi’, salt-preserved, dried Sawara roe delicacy especially from Kagawa prefecture. Photo from ‘Uoji Inc., Official Site‘, a shop in Kagawa prefecture which specialises in fish from the district. Roe of Sawara preserved in salt then dried is called ‘KarasumiW’. They are made in Kagawa prefectureW which is an expensive delicacy like CaviarW of Russia. Most of the Karasumi that are sold in the markets of Japan are made by mullet roe in Nagasaki prefectureW or those imported from China but Karasumi made in Kagawa prefecture is made from Sawara or other mackerel. If you ever have a chance to travel around Okayama prefecture or Kagawa prefecture which are two prefectures,　which opposite across the Seto Inland Sea, at this time of the year, we would definitely recommend you trying fresh Sawara sashimi and Karasumi made from Sawara roe which is hard to eat outside these areas. Sawara’s best season is before laying eggs while their fresh is fatty and juicy which could also be easily bought in supermarkets all over Japan at this time of the season fresh, as well as read in classical poetries to point out the season!